Wales manager Ryan Giggs has absolutely lavished Chelsea youngster Ethan Ampadu with praise after his development in recent times. The 18-year-old midfielder has recently made a breakthrough at international level for the senior Welsh national side, and looks ever closer to more of a regular first-team role at Chelsea. Given the Blues’ patchy record when it comes to promoting players from their youth team, that’s really quite an achievement by the talented teenager. A real all-rounder in the middle of the park, Ampadu looks a huge talent and Giggs has also praised his attitude from what he’s seen of the player on international duty. Discussing Ampadu, former Manchester United star Giggs said he felt he could be in store for a very bright future indeed, which is some compliment coming from one of the finest Premier League players of all time, as well as a Welsh football legend. “It’s hard not to get carried away with Ethan because he I think he can be anything he wants to be,” Giggs is quoted by BBC Sport. “But he is only 18 and he’s not playing regularly, so you have to take that into account. “But what a player and character to have – a manager’s dream. That’s fantastic to see. 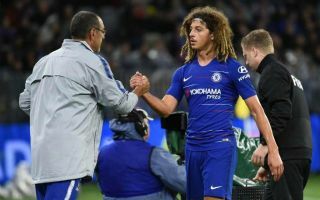 Chelsea fans will just hope Ampadu doesn’t become the latest youngster to leave Stamford Bridge for first-team football and end up shining for their rivals elsewhere.